Interested in networking with employers this summer? Check out these receptions! NYC Event: The Kate Stoneman Project invites first year female law students for a reception and panel discussion focused on the benefits of practicing at New York City firms. The event will be on Monday, June 4 from 6:00 PM-8:00 PM at Cleary Gottlieb. Please RSVP to Christina Sauerborn at csauerborn@cgsh.com. DC Event: The Diversity Committee of the Washington Area Legal Recruitment Administrators Association (WALRAA) is pleased to invite you to the inaugural, Summer in the Capital: A Fall Recruitment Preview for Students & Employers on Monday, June 18, 2012 from 6:00 pm to 8:00 pm at the Ritz-Carlton Hotel Washington, 1150 22nd Street, NW, Washington, DC. You may register here,http://www.surveymonkey.com/s/92GGD33. Please register by Thursday, June 14. 1501 K Street, N.W., Washington D.C.
901 New York Ave., N.W. Bingham’s Summer in the City Reception in Boston, Los Angeles, New York, San Francisco, Washington, D.C. Check out a few new items under "News, Announcements & Tips" on our homepage! Don't forget about upcoming Job Fairs around the country happening this summer. A complete list can be found here. Lastly, Diversity Opportunities are updated as deadlines become available. For a complete listing of these check out the 1L page and the 2L page. Join attorneys from Haynes & Boone at Four Square in Durham on Tuesday, March 20 from 6:30-8:30 PM. Business casual attire, and drinks and appetizers will be served! If you're interested, send your resume and transcript to Laura Kingham at laura.kingham@haynesboone.com. Please RSVP by March 16. "Life in a Law Firm: An Overview"
Parker Poe’s sixth annual minority law student program being held in Columbia, South Carolina on Saturday, February 4, 2012 and in Raleigh, North Carolina on February 18, 2012, from 8:30 am to 1:30 pm. This program, “Life in a Law Firm: An Overview,” will include panels of practicing attorneys discussing topics such as the distinction between a litigation practice and a transactional practice and highlights from a day in the life of a lawyer. During lunch students will be able to participate in informal discussions with attorneys and other students. After lunch, students will take a tour of Parker Poe’s Columbia or Raleigh office followed by several smaller break-out sessions on topics related to the transition from law school to law practice. In addition to the break-out sessions, students will have an opportunity to participate in an individual mock interview with an attorney. Tto register for this program, students may send an e-mail to crystaljones@parkerpoe.com or call Crystal Jones at (704) 371-6165 with any questions. The following are CPDC events happening within the next two weeks. 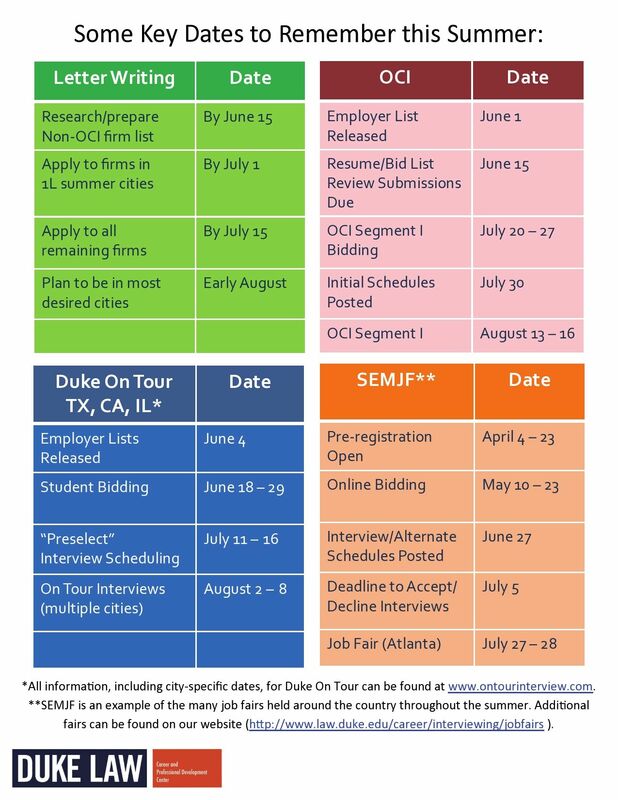 Visit the Career Center website for more information, and feel free to contact Emily Sharples (sharples@law.duke.edu) if you have any questions. We hope to see you there! Please join Arturo H. Banegas Masiá LLM '00, a Senior Legal Consultant at Verizon Wireless and Julian R. Vasquez LLM '05, Director - International Tax Services at PricewaterhouseCoopers, for an informal conversation about working as in-house attorneys at major corporations and the career path that led them to these positions. Lunch will be provided. For more information, contact Oleg Kobelev at kobelev@law.duke.edu. The Women Law Students Association is hosting its second Women in the Law conference. Panelists will discuss policy issues facing women, careers in foreign relations and in the Armed Services, and how to transition from student to successful associate. For more information, please contact Kate Dickinson at kjd16@duke.edu. Private Equity Deals: Stories from the Front Lines with Debevoise & Plimpton Please join partners and associates from Debevoise & Plimpton as they walk you through a typical private equity deal and discuss the financing steps. For more information, please contact Jennifer Lan at jennifer.lan@duke.edu. Though its hard to believe, its time to start preparing for the Bar Exam. Dean Elvin, Dean Jason Belk and the Executive Director of the Board of Law Examiners held a quesiton and answer panel on Tuesday, September 20th to discuss the Character & Fitness portion of the Bar. Unable to attend the program in person on the 20th? Find the Nuts & Bolts presentation here. 2Ls & 3Ls: Student Advisory Board positions open now! We invite you to apply to join the 2011-12 Student Advisory Board to the Career & Professional Development Center. The Board will be comprised of approximately 15-20 students from all three years and will meet at least twice per semester. Since career development has such a significant impact on all aspects of both student life and the atmosphere within the Law School, it is essential that students are involved in important decisions and have the opportunity to present their thoughts, raise questions and concrete suggestions in an organized forum. In addition, upper level members work with 1Ls and LLMs on mock interviewing, resumes and skill development. In prior years, the Board's collective input was instrumental in revising Law School Rules & Policies, assessing the timing of campus interviewing, selecting the winning student organization for $1000 to host an Open Doors Speakers program, contributing to the website, teaching LLM students, interviewing candidates to join the law school and more. We have some new ideas for ever deeper Board responsibility and would welcome your thoughts, too. Please apply by emailing a paragraph describing why you are interested in joining the Board to Emily Sharples at careercenter@law.duke.edu by Wednesday, September 14, 2011, at NOON. Since we know you have many other obligations, the meetings will be as efficient and rewarding as possible, and lunch will be served. As we near the end of the week of OCI Segment I here at Duke, take a moment to reflect on your interviews and how you feel the week has gone. Though it was exhausting, we do hope you enjoyed the experience and feel confident coming out of it and heading toward classes next week. Here are a few articles to keep you encouraged, and to give you some advice for the next steps in your job searching joruney. Keep your chins up, and remember, this a grueling process for everyone, so you are not alone! Connecting with others - without social media! Keep your head above water - at all times, not just the summer.